I know it’s not exactly relevant to the theme, but I’ll likely be sneakily inserting mountain pics into my posts for the next little while. Whew, what a workweek I’ve had. The first half was pretty typical 10-6:30 kinda stuff, but the last two days I’ve had to run dinner service solo. Sunday I typically run dinner alone, but it’s not really a huge issue since we do a giant roast and sous chef Robin makes sure I’ve got everything well in hand before leaving around midafternoon. Today, however, Robin called in sick so it was just Chef Katie and I all day. I didn’t stop from the moment I got in until about 15 minutes ago when I finally left for the day (clearly I actually wrote this post last night when I got home from work but waited until this morning to go poach some interwebs at my local coffee shop). First we did lunch and I whipped up a chicken and veggie soup, set up 30 various desserts, sliced and wrapped a loaf of banana bread I’d made a couple days before, steamed and seasoned the side veg, and cleaned up before getting started on my dinner prep. After lunch I basically prepped, served, and cleaned up after a 3-course dinner for 40, which I have never done before and to be honest, don’t really want to do again. It wasn’t too bad, really; I’m just a little sleepy and whiny meow. Tomorrow is day one of my days off this week though so I’ll be back and full of beans in no time. Plus… overtime looks pretty nice on the ol’ pay cheque. You may recognize this little guy from last time. Yummy chocolate custard sans dairy! Our last CNE potluck dinner. I made roasted garlic and cauliflower soup and my custard. This picture is only a fraction of the deliciousness we ate that day. 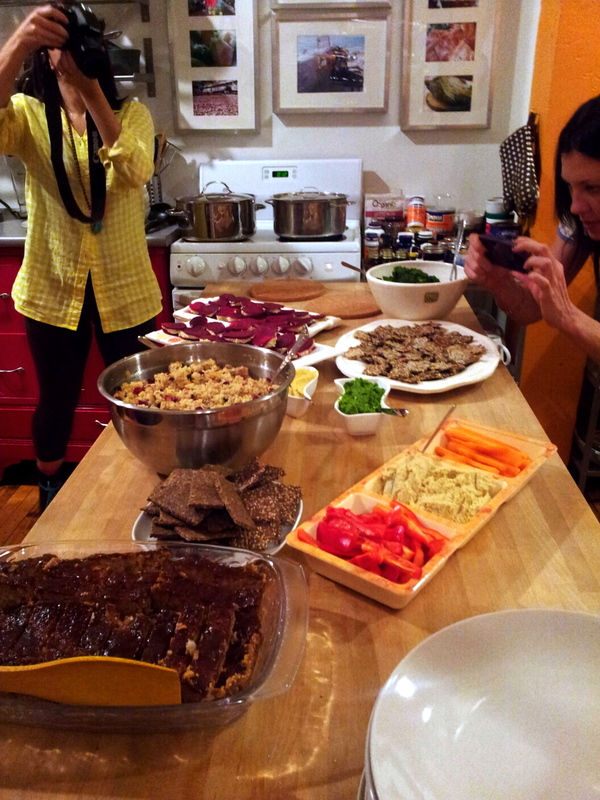 That’s Meghan in the background taking a real picture of the feast. Back to the custard, this recipe is insanely simple and crazy delicious! I’m not going to lie I have definitely eaten an entire batch to myself within 2 hours of it setting. I came up with it back in December when I needed to do a food demo for the last CNE class in Meghan’s kitchen. Now there was a day of feasting, let me tell you. I think it was about 6 or 7 hours of straight eating? The only thing that makes it slightly ok is the fact that it was all pretty healthy stuff, despite the volume. Alrighty, enough with the tangents, let’s get to the good stuff. So the recipe has only 4 basic ingredients, making it an amazing base for pretty much anything your lovely imaginations can come up with. 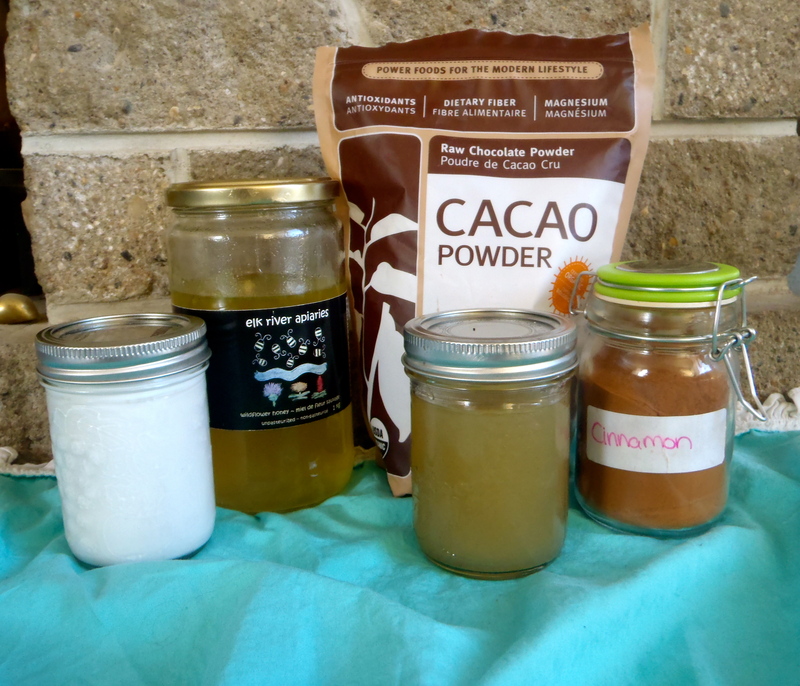 Our 4 rock stars tonight are coconut milk, raw cacao, Irish moss, and maple syrup or raw honey. If you’ve read any of my previous posts you probably know that I’m obsessed with coconuts in their myriad forms and for good reason! This fruit has some pretty amazing health benefits. Coconut oil is mostly comprised of medium chain triglycerides (MCTs), which are easily transported into the mitochondria of our cells (these are our cells’ powerhouses where energy is converted into forms usable by our bodies, wahoo!). The easy transport of MCTs into our cells means they are quickly and easily burned by our bodies instead of being stored as fat, thus preventing our booties from becoming too bountiful. Coconut oil also has antibacterial effects in the body thanks to its lauric acid content (a type of saturated fat), which can help prevent us catching that nasty cold going around the office. Our fab… five because I added cinnamon to this batch. I’ll tell you why below! Oh chocolate, we’ve had a lifelong love affair that started when I was 3 months old and my 24 year old father introduced us in an attempt to get me to stop crying. My mother was horrified and clearly I was delighted as chocolate and I have had a tight bond since. Now most of the chocolate you get at the grocery store or at the gas station treat aisle is full of high fructose corn syrup amongst other unsavory ingredients. Raw cacao on the other hand is the uncut good stuff. It’s one of the highest food sources of magnesium, a mineral that is incredibly important for proper muscle contraction (and to the ladies in the audience, very useful in helping treat those damn monthly cramps. Suddenly chocolate cravings begin to make sense…). Raw cacao is also crazy chock full of antioxidants, blowing most other foods out of the water. We want to consume lots of antioxidants because, as their name suggests, they help prevent oxidative damage caused by free radicals in the body. Free radicals are atoms, molecules, or ions with unpaired electrons that can either be created as byproducts of natural bodily functions or can be ingested, inhaled, or absorbed. Since their electrons are lonely and searching for “the one” they roam around your body either looking to steal an electron or lose an electron from our cells. This inability to commit to the atom, molecule, or ion they’re already with makes them very volatile and enables them to change the form or function of cells in your body. Enter Super Antioxidants, who ever so nobly donate an electron to the free radical, making him happy and whole in his new relationship. The AOs are able to donate an electron without actually becoming free radicals themselves. Win win! One of the honeys I bought in Fernie. This is the lighter one from Elk River Apiaries. How pretty is that label? Bonus: It’s incredibly delicious as well! Raw, unpasteurized honey (not the stuff that comes in the shape of a bear) has tons of great health benefits. It is a form of sugar, so you don’t want to go too crazy with it, but including small-moderate amounts in your diet can have antimicrobial, antiviral, and antifungal effects. It can also have antioxidant properties and help strengthen your immune system, which is a fantastic benefit for the current cold and flu season (it seems like it’s always cold and flu season, no?). Not to mention it’s delicious and it can come in all kinds of different flavours depending on what flowers the bees were mostly pollinating. I just bought 4kg of two different types of honey while I was in Fernie and even though the bees lived in the same valley, the colour and taste of each honey is completely distinct. Amazing! Look for raw or unpasteurized on the label, or go local. Most farmers’ markets have at least one or two vendors selling their own awesome honey products. 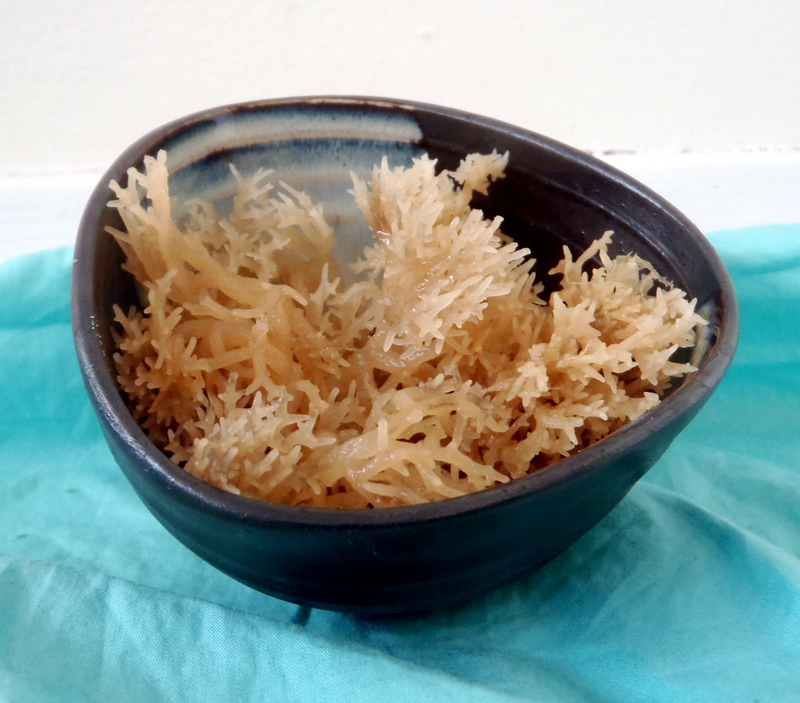 This seaweed is amazing to use as a thickener in soups, smoothies, custards, sauces, gravies, you name it! It’s my go-to for pretty much everything. This moss comes from the sea and so contains tons of essential minerals, such as iodine, which is necessary for proper thyroid function and for preventing the growth of those super scary looking goiters. The soil in many parts of Canada is actually iodine deficient, so the food that grows there is, by extension, also deficient. As such, it’s important to incorporate seafood and sea veggies into our diets to ensure adequate intake. It is also a great source of soluble fibre, which is the type of fibre we want most in our diets. 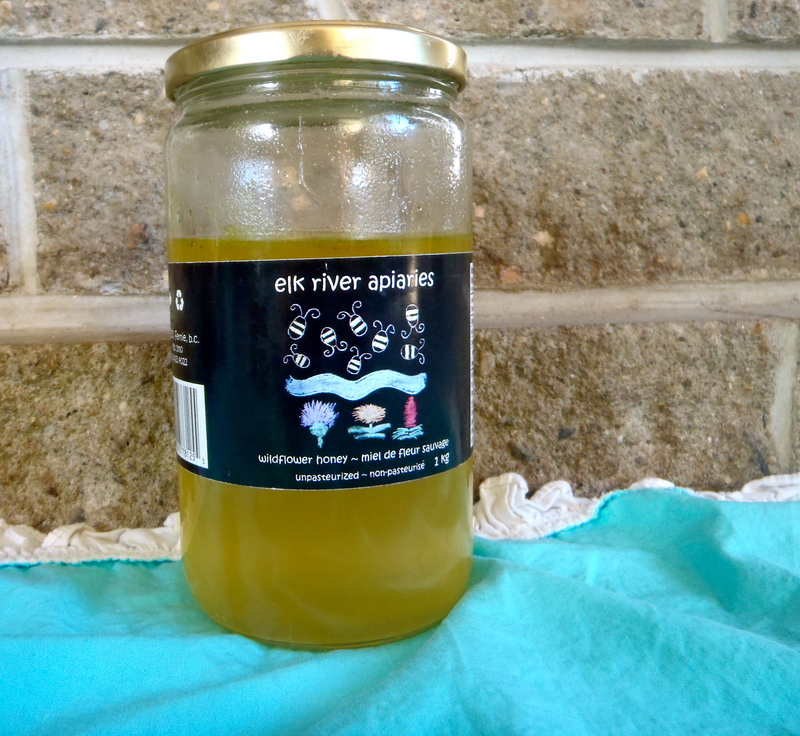 This fibre helps propel waste along our digestive tracts and makes it easier to absorb and eliminate toxins from the body. 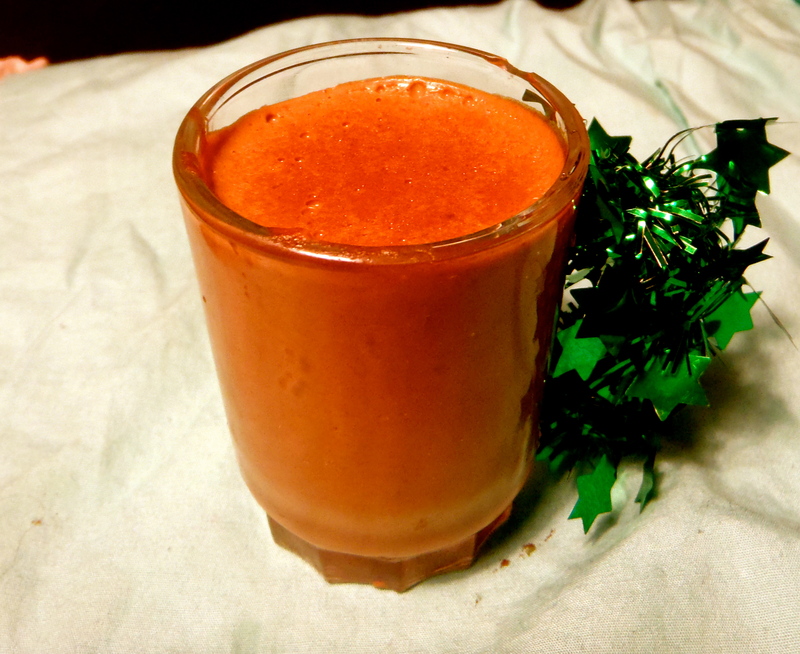 Preparing Irish moss for consumption is super easy. Rinse it through several times under running water until all the sand is gone. Then throw it in a pot, cover with water and boil until squidgy. Once softened, remove from heat and blend until smooth. You can store this stuff in the fridge almost indefinitely. Irish Moss in its raw form before boiling and blending. I love adding cinnamon to my chocolate custard 1. Because it tastes amazing and 2. Because cinnamon helps manage blood sugar levels, which is definitely important when we’re eating treats. Alright, now that I’ve hit you over the head with some sweet nutritional information, lets get to the good stuff. In a double boiler melt 2 cans of coconut milk and thickener of choice. Whisk together. 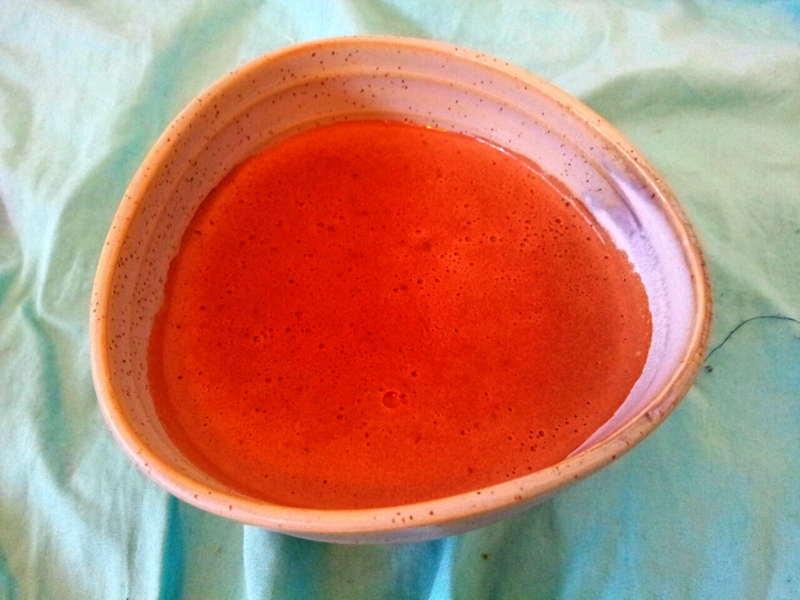 Add ½ cup of raw cacao. Add maple syrup or honey. You can add more for extra sweetness, just don’t go crazy. It is sugar remember, despite it’s health benefits. Add 1 tsp. cinnamon, vanilla, and turmeric, if desired. Remove from heat and portion into ramekins in ½ cup servings. Place in freezer to set for at least an hour. If setting in the fridge, let set for at least 2 hours. However, I usually cannot wait nearly that long, so if you don’t mind it a little less firm I’d say 30 minutes in the freezer is all you need. Optional: You can totally top this custard with a dollop of whipped coconut milk to add an extra touch of lusciousness. The water and solid cream should separate. Well there we have it folks! My deliciously simple and delightfully healthy chocolate custard. Thanks for joining me today! Happy eating! PS: I’ll be doing a guest post this week on my friend Lauren’s blog. I’m pretty pumped! Hope to see you all there and definitely go check out her site. Your tummy will thank you.